As part of Design4India initiative, NASSCOM invited Hari Nallan to conduct Design Thinking workshop for its participants. Witnessing participants from startups and growth stage companies, Hari took participants through two days of intensive sessions on toolsets and frameworks to impart practical knowhow in Design Thinking. Continuing our commitment to spreading our knowledge to educational institutions, Rama Aleti conducted a one day workshop at the film institute in Hyderabad. AISFM is a initiative of Annapurna Studios, one of the first and most prestigious film studios in Telugu film industry. AISFM has collaborative activities and academic exchange programs with leading universities from around the world. Think Design’s Hari Nallan and Deepali Saini took a course on Design Research Methods at the National Institute of Design, Ahmedabad campus. Spanning one week, the course familiarized students of multiple disciplines to Design Research methods and perspectives. Among other modules were Industry case studies drawn from Think Design’s own practice, thus providing practical insights to students. As part of its annual event, Entrepreneurship Development Institute, Ahmedabad invited Mahesh to conduct Design Thinking workshop for the entrepreneurs. Taking the participants through various methods and frameworks, Mahesh imparted the concepts through “learning by doing” methodology. Creativepool is the creative industry network with 210,000+ members and 17,200+ companies. It is a matter of great pride for Think Design to be among the finalists, competing with best of the best in this world. FiGO is a disruptive concept that would change the way people use data while roaming internationally. With its proposition that is like no other and User Experience that is unmatched, it is among the top contenders to win the award. FiGO is now among the finalists for the award. The year 2016 was the year of growth, excitement, recognition and fulfilment for us. Catch up with this video slideshow of our work and activities, spanning the whole year. Figo is a disruptive concept that would change the way people use data while traveling internationally. By providing data at local rates without having to change the carrier’s SIM, it truly puts the power of technology in the hands of its users… and How! The next time you travel internationally, don’t forget to use Figo. View on Playstore. With Axis Direct, we were on a mission to make investing ridiculously simple to comprehend. The result of one year of belief, diligence and grit is this “never seen before” trading and investment platform that promises to relate to every individual wanting to invest. Do visit www.axisdirect.in and multiply your wealth. Story of the Month: What makes us, India’s Best Design Firm? An interview with key people at Think Design, this interview covers insights from the founders and leadership teams at Think Design as to why they think we are India’s best design studio. Play and find it out! Think Design is delighted to announce the launch of Hindustan Times’ digitally transformed news portal, www.hindustantimes.com. The new site boasts of enhanced features and functionality, in addition to responsive layout, better content comprehension and discovery through layout, color blocking and visual hierarchy. Being one of the oldest news brands in India, HT’s new site could set the tone for the industry to follow. As a pioneer in User Experience practice in this geography, we saw this coming. The verdict is out! We are India’s Best Design Studio 2016: A proven track record of 12 years, impacting 9 key sectors with 400+ products designed. Think Design has entered the final round of evaluation at POOL Magazine’s India’s Best Design Studio awards. The award invited participation from few of the most well known companies and design studios across the country. Think Design participated in CommunicAsia, Singapore event. Deepali Saini was invited to speak on a couple of topics of interest at the event, which were delivered with great success. View the pictures here. Think Design’s Deepali Saini delivered a seminar on CX Driven Insights: The Think Design way, at CommunicAsia Singapore. The seminar familiarized participants with the concept of Customer Experience and how it informs User Experience; going forward, how to derive insights from CX workshops and use them to build winning products and services. Think Design’s Deepali Saini delivered a seminar on “Imagining a future and creating it”, at CommunicAsia Singapore. The presentation focused on Articulating Vision, Segmenting customers, Articulating proposition, Thinking user journeys etc., among other key topics. Continuing Think Design’s participation and proactive advocacy of Design Thinking, Rama Aleti conducted Design Thinking workshop at NASSCOM Coimbatore event. The workshop acquainted participants to fundamentals of Design Thinking in the context of designing User Experiences. Think Design is proud to announce the release of transformed NexGTV app. The engagement involved addressing UX Vision & Strategy, Innovative Feature list, Visual Branding & Communication, Wireframing, Storyboarding, Specifications and Development Coordination. This update will be impacting more than 10Million users across India. Think Design is proud to announce two feathers in the cap of Axis Edge rewards: Winner of ‘Champion of Champions’ and Winner of ‘Best Rewards program’. This further proves the prowess of Think Design and at a larger level, the relevance of good UX in Banking and Finance sector. UX design journey: Axis Edge. Axis edge rewards portal. Think Design’s Rama Aleti conducted Design Thinking workshop at NASSCOM Centre of Excellence, Trivandrum. The workshop acquainted participants to fundamentals of Design Thinking in the context of designing User Experiences. Rama took participants through Articulating UX Vision, Solution Thinking, Fundamentals of UX, Problem solving frameworks among other key topics. As part of GE’s Digital Transformation initiative, Think Design collaborated on one of GE’s most important initiatives, GE Empower. The web based application helps its users get information, place orders, track shipments, research invoices and more. True to its name, GE Empower now empowers its users through seamless processes and service; and provides transparency for the first time ever in the category. Hari Nallan and Rama Aleti of Think Design conducted Design Thinking workshop at Arthur Lok Jack GSB, customized for one of Caribbean’s largest business conglomerate, the AnsaMCal group. Spanning two days, the workshop was delivered to teams from various verticals of the company. Think Design’s Amitabh Basu and Shavak Tanwar conducted Service Design workshop at Bajaj Finserv’s corporate campus. Spanning three days, the workshop was intended to lay foundations to the newly formed venture… Inviting participation from top leadership team of the venture, the foundation couldn’t have been stronger. Using Design Thinking as a starting point for incubating a new business comes highly recommended from Think Design. We wish all the best for the new team! Linchpin is a enterprise learning app that makes the process of learning engaging, fun and rewarding. Think Design partnered with Emids to strategize, conceptualize, design and build this application from ground up. Launched as a browser based app, the application will soon be available in Appstore and Google Play. New workspaces bring in all energy and new capabilities. Think Design moved its Bengaluru office recently to new location. The studio has been designed and coordinated by Think Design’s own members, bringing in fresh environment, infrastructure and more capacity. View the pictures here. Think Design is proud to announce release of the app, Playablo. The platform aligns to syllabus of education boards thereby providing learning focused on students’ academic growth, with competition that is global. Further, the platform provides parental access to their wards’ progress and real-time performance reviews thus making it a comprehensive platform to learn and grow. Download the app from here. Axis Bank is India’s third largest private sector bank and offers entire spectrum of financial services to its customers. As a part of their customer engagement initiative, Axis’s Edge rewards portal was revamped to see through User’s goals and aspirations; and connect bank’s business objectives with them. Through a mobile-first approach, Think Design shaped up the portal to be easy to use from wherever the customer is… and present a Edgy, Modern and Responsive face to the customers. Hari Nallan of Think Design conducted a 2-day Design Thinking workshop at IIT Delhi. Initiated by Social Innovation Centre of the university, the two day workshop was designed to expose the students of various disciplines to fundamental concepts of Design Thinking, Systems Thinking, User Centered Design, User Experience Design and UI Design. Extramarks is an award winning, new-age digital education solutions provider. The company provides 360 degree solutions for K-12 education and competitive exams. Extramarks and Think Design collaborated to improve UX of products, solutions, apps and website. One of the early initiatives to this effect was to revamp the website in order to align it to strategic initiatives and improve User Experience. Initial changes of the website went live in the month of October. EAD (Entrepreneurship Awareness Drive) is a initiative by Entrepreneurship Cell, IIT Kharagpur; and is a non-profit student organization, dedicated to the cause of promoting entrepreneurship among students. Hari Nallan of Think Design was invited by the organizers to speak about his entrepreneurial journey and touch upon User Experience and how it is important for new generation start-ups. Engagedly’s mission is to improve employee engagement by making workplace fun and motivating. 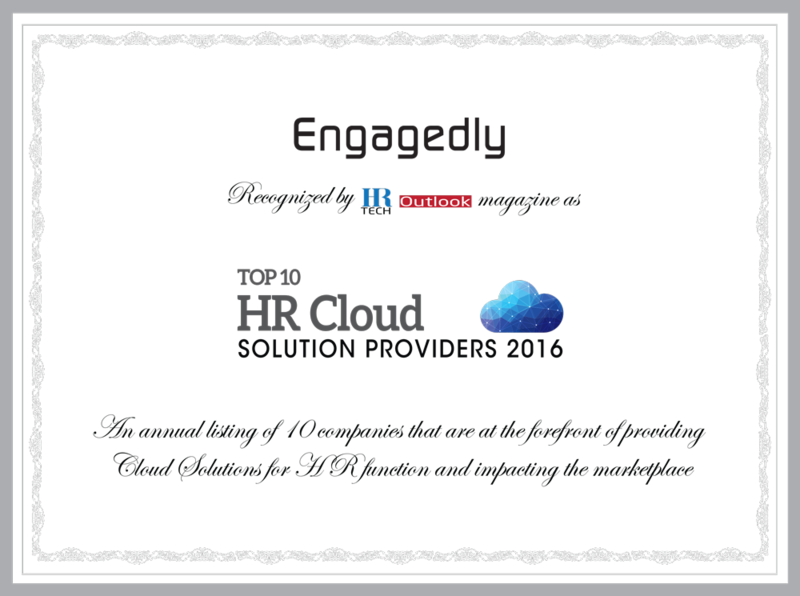 Think Design’s Bengaluru team collaborated with the company to design and develop one-of-a-kind employee engagement platform Engagedly is a comprehensive cloud platform (SaaS) providing 360 degree talent management and is built for improving engagement and building high performance teams. Janga Media’s initiative, Skribe is designed as a Media information, insights and analytics platform, that allows marketing and PR professionals gain instant access to rich media data set. It maps 15000+ journalists/ influencers over 3500+ media… ranging from the dailies, regionals, magazines, broadcast to blogs. Spanning India’s 29 states and top 80 cities, the digital platform is one-of-a-kind in this space. As part of its Customer Success Management solution, Gainsight launched its Customer Survey Application. The application helps enterprises design and manage surveys for superior Customer Success Management. Think Design’s Hyderabad team worked on User Experience Design of the web application by engaging through Stakeholders’ vision, designing and developing enterprise and end user flows of the responsive application. Phaneesh Murthy founded firm, PMHLC has launched its modern health exchange portal, Zigy (dot) com. The portal and apps connect chemists and druggists with consumers. Think Design’s Bengaluru team worked on User Experience Design of the web portal, Android and iOS apps for Zigy. Think Design is proud to be associated with the disruptive platform, that is powered by innovative workflows & take care of prescription compliance at the same time. XPRShealth (dot) com is a online health portal that guide patients in making informed health decisions. With the help of is a online health portal that guide patients in making informed health decisions. With the help of Android and iOS apps, patients can now find doctors, clinics, labs or pharmacies, book and schedule appointments, get directions, alerts and more… Patients can also view their lab reports in the same app. Delivering yet another workshop at Arthur Lokjack GSB, Rama Aleti and Hari Nallan of Think Design coached teams through 6-day intensive sessions. The teams came up with three absolutely stunning and globally relevant product ideas, after going through tightly packed information, coaching, introspection and presentation sessions. Think Design’s Rama Aleti uncovered using Design Thinking to solve User Experience related problems, at Unicom event in Hyderabad. The interactive conference covered topics like UX Fundamentals, Design Thinking fundamentals and methodologies; and creating approaches for problem solving. Think Design’s Deepali Saini spoke at McKinsey’s UX Crispies event, providing insights into residual, dominant and emerging states of UX practice across organizations. The talk focused on how User Experience practice transitioned from skill based to role based now and how it is shaping as a goal based practice in emerging organizations. Think Design’s Deepali Saini presented seminar on UX for Business. The talk focused on Think Design’s context in the domain of User Experience and how we see the domain shaping. Among other key topics, her opinions on Residual, Dominant and Emerging approaches drew significant interest among audience, who were keen to seek answers to few real challenges they were facing. Think Design’s Rama Aleti presented one hour seminar on UX Design at Verizon’s center of excellence. Drawing participation from their Chennai and Hyderabad offices, the talk covered Think Design’s method, few live problems we solved and invited discussions on how we engage with clients and future collaboration possibilities with Verizon. Think Design is proud to announce the launch of E-commerce platform for art, Indian Art Collectors (dot) com. . It is the largest online platform in India for art; and brings artists, galleries, collectors, dealers and art resellers together by way of its online user experience. Think Design helped the company transform its presence with its current version. Think Design’s Hari Nallan and Deepali Saini delivered Design Thinking workshop to 99Acre and Siksha teams of Infoedge Ltd. The workshop invited participation from UX Designers, Design leaders, Product Managers and Product heads; and was delivered in “Learning by Doing” methodology. Participants were familiarized to concepts of Empathy, Creativity and Rationality among others. New workspaces bring in all new energy and new capabilities. Think Design moved its Head office/ New Delhi studio recently to new location. The studio has been designed and coordinated by Think Design’s own members, amalgamating different perspectives in unison. View the pictures here. Rama Aleti of Think Design conducted UX Thinking workshop at Indian Institute of Information Technology, Design and Manufacturing. The annual event, Dew 2014 had eminent speakers and national and international design leaders, delivering workshops and seminars at the prestigious institute. Indian middle class & perceived value: Seminars delivered at Tokyo along with trinity Co. ltd.
Month of October saw many initiatives from us, leading to increased design awareness in the world. This seminar was conducted by Trinity Strategy India, a exclusive research company co-owned by the founders of Think Design, Trinity Co. Ltd and Cleat Inc. Seminars were delivered at JAFCA and JIDA and involved many industry stalwarts. JAFCA, JIDA, TRINITY CO. LTD. Continuing the tradition of imparting Design and Innovation education on the Caribbean, Arthur Lok Jack GSB and Think Design delivered 10 day workshop for the students of executive MBA. The workshop exposed students to Design, Innovation, Design methods, Prototyping and several other aspects of bringing ideas to life, through learning by doing methodology. Hari Nallan and Rama Aleti of Think Design conducted Design Thinking workshop at Arthur Lok Jack GSB.. Spanning one week, the workshop was delivered to one of Caribbean’s largest business conglomerate, AnsaMcal group and include top leaders from the company. Think Design opens its operations in Mumbai, one of the oldest cities in India and a major business hub. With this initiative, Think Design is present across all major cities in India, with its team, clients and partners ready to disrupt the connected world. Think Design’s CEO, Hari Nallan meets Stanford Engineering students at NASSCOM youth centre. This was organized by NASSCOM to deliver to the students, insights and perspectives into Design businesses in India. Launched: Pyoopil (DOT) com, an online lms platform that was designed UX first! A labour of love for young entrepreneurs, Pyoopil is an education startup, which aims to empower educational institutions, teachers and students alike. Pyoopil (dot) com connects teachers, students and institution administrators through a LMS platform that’s intuitive and highly interactive. Think Design helped the founders bring their ideas to life… and how! An Interactive ‘co-creation’ platform for home decor has been launched by Godrej Interio. It provides an intuitive and engaging ‘design customization’ which combines customer ideas with Godrej’s furniture design and execution expertise. Rama Aleti Brahmam, UX Design Head was a speaker at NPC Cochin 2014 – a unique event wherein the best and brightest technology leaders, emerging companies and startups congregate. It was a carnival of fresh thinking, innovation and learning. As part of Think Design’s initiative to educate Indian software industry in UX Design, Rama Aleti Brahmam, UX Design Head conducted a Solution Thinking workshop along with NASSCOM. The workshop was held at Nasscom Centre of Excellence, Bengaluru. As part of Think Design’s initiative to educate Indian software industry in UX Design, Rama Aleti, UX Design Head conducted Solution Thinking workshop along with NASSCOM. The workshop was held at Nasscom Centre of Excellence, Chennai..
Usha fans launched its E series of premium Decorative fans. Designed by Think Design and co engineered by Usha team and Think Design, the range currently offers two fans, designed to suit modern home interiors and users with evolving tastes. Safexpress android app puts power into the hands of its delivery personnel through quick workflow & intuitive controls. The app is being used by field personnel of the company and is available for Android mobile and tablet devices. TrulyMadly is a modern day matchmaking service for independent minded individuals to find suitable matches beyond the confines of caste and creed. With a clear focus towards the aspirational generation, we set out to create their multi-screen presence with a responsive website. As part of Think Design’s initiative to educate Indian software industry in UX Design, Rama Aleti Brahmam, UX Design Head conducted a Solution Thinking workshop along with NASSCOM. The workshop was held at Nasscom Centre of Excellence, Hyderabad. Yebhi(dot)com, one of India’s foremost ecommerce portal ventured into mobility with the help of Think Design. Yebhi’s Mobile shopping is now available on Android Mobile, IOS Mobile and iPad formats. Design features easy to use search and filter pattern apart from intuitive navigation and menu structure. The new design aligns with rebranded Yebhi identity as well. As part of Think Design’s initiative to educate Indian software industry in UX Design, Hari Nallan, Think Design’s CEO conducted Solution Thinking workshop along with NASSCOM. The workshop was held at Nasscom Centre of Excellence, New Delhi. This was just the beginning of a series of such workshops to be conducted. Indian Oil’s Solar lantern recently won CII Innovation award, competing against 20 other companies. Think Design was engaged in design of the innovative and multi-purpose lantern. The lantern is designed for Indian rural audience, provides multiple functions in one single product and is available at an affordable price as well. Infozech’s ETS helps telecom companies track and monitor energy consumption through cloud based platform. The application provides easy to use Dashboard, Reports and Analytics, Billing and Error tracking modules. Rama Aleti and Hari Nallan returned after successfully conducting workshop at Arthur Lokjack GSB, University of W.I. The two week workshop focuses on taking students through product development process in a interactive and practical approach. Deepali Saini was one of the selected entrepreneurs trained as part of Goldman Sachh and ISB’s 10,000 women programme. The programme concluded with presenting B-plan to external jurors comprising eminent Industry professionals. Deepali’s B-plan won the best B-plan award. Arthur Lokjack GSB, University of W.I has just unveiled its incubation portal designed and developed by Think Design. The portal features online application form, infographic for selection process to be followed by jurors etc,. Know more. Think Design’s team returned after successful execution of Idea facilitation workshop at Arthur Lokjack GSB, University of W.I. The workshop spanned 2 weeks and witnessed participation from 25 students of Executive education at the Business school. Think Design’s Hari Nallan returned from Tokyo after presenting “Tendencies of Indian Generation Y” at Tokyo. The seminar was conducted at three different locations, targeting Educational Institutions, Industry and Government organizations. Paras Dairy launched refreshed packaging of “Pure Desi Ghee” in 16 SKUs and related variants. With leadership in the industry and vision to pioneer innovative, high quality packaging design, Think Design and Paras Dairy embarked on this journey. Nutricrisp, a new superbrand in the making, has just launched its range of breakfast cereals in the Indian market. Currently available in four variants, the company has ambitious expansion plans. Think Design designed Brand identity and packaging design of all its current variants. Simplifymytraining.com connects training providers, training seekers and venue providers through its web based application. Spanning three months, Think Design provided solutions in UX and UI design, Visual Design and Front End development. Usha Kids fan range was designed with graphic application of two most popular cartoon characters in India. All the graphics applied were generated through a storyline created after understanding the original characters and their tendencies. Colorbar USA launched its latest Kiosk, designed, developed and coordinated by Think Design. The kiosk is designed to be modular and scalable. First in series has been deployed at Great India Place (Mall), Noida. Rama Brahmam Aleti of Think Design was invited at ISB, India’s premier business school that is one of a kind to present views and perspectives on the topic, “Best practices for building educational websites and other interfaces”. Colorbar USA has unveiled three of its chain stores at New Delhi, Ahmedabad and Mumbai in high streets and malls. These are a series of stores being developed since September 2011. Currently, Colorbar has presence across North, West and South of India at 15 odd retail locations. www.milkorwater.com, finance and stock trading portal launched. Think Design’s interventions include IA and Navigation, Wireframes and Storyboards, Visual design and Front end. www.finodex.com, finance and stock trading portal for Eurozone launched. The portal, based in Netherlands provides vital information to stay ahead and improve investment decisions..
Edutor, an android platform based educational application was unveiled in India. The application can be used by high school children. Content and features made available include subject books and publications, tests and results, scheduling and incentives. Vantage Trade vantagetrade.com is a subscription based service that provides with complete cycle trading decisions in the form of Buy and Sell calls. Think Design played a pivotal role in designing UI, Navigation and Visual elements of the portal. KLF Nirmal, India’s second largest coconut oil brand, has launched its refreshed identity and packaging design. Think Design played a pivotal role in strategizing packaging identity and realizing them across 14 different SKUs and variants. With the launch of refreshed identity, KLF grew stronger in its key markets and gained further visibility, aspirational value and customer relevance. Dipesh Parmar, Industrial Designer at Think Design wins first prize in the category, Future Bathrooms at Design Mile awards. He designed a bathroom that optimizes water usage by recirculating within. As water scarcity is increasingly becoming national concern, his entry opens up hope and opportunities. Amstat premier application provides vital business and statistical information about aircrafts. This helps those in the business of buying, selling and financing corporate aircrafts. Think Design intervened with design of web application and later, with IOS application. Hari Nallan presented Think Design’s innovation process applied for Godrej Interio’s U&Us furniture range. The conference, which witnessed participation from various leading Industries, was themed on “co creation” for sustainable innovations. Think Design helped Microsoft in User Experience and Visual design of its Bing Deskbar. The bar features Finance, News, Weather and other popular widgets in a intuitive customizable interface. Think Design was instrumental in defining the set of icons for the latest version of Symbian communicator module. All icons were in vector format (and hence scalable) and primarily focused on touch screen usage. Further, icons needed to be visible and readable in white as well as black backgrounds. Whirlpool’s Superwash was conceptualized as a low cost and highly competitive semi automatic washer range. Owing to that, the washer needed to be taller, look more voluminous, have increased transparency, enhanced UI and eye catching CMF. There was a wide spread misunderstanding in the industry that Semi Automatic washer was preferred by its users as they could not afford something better. This was washed away when Whirlpool introduced “Ace Wash Station” that disrupted a category and its market! This was last of the series that Videocon would launch before finally phasing out CRT televisions. It was important, hence to aspire users to buy the same brand’s LCD range, once they upgrade. Further, styling needed to connect to small town buyer! Range of Point of Purchase display and dispensing units were designed for Coke. Launched during Diwali 2010, these units were designed around traditional Indian setting themes, adapting Coke’s 2010 graphic theme of the year, “Warli art”. Think Design was asked to develop compelling display and dispensing units for the brand. Think Design designed display and dispensing systems that were low on merchandise and high on visibility. Further, the merchandise was displayed at a convenient height to grab from. Godrej inaugurated its first U&Us store at Thane, Mumbai. U&Us is a new line of business under the umbrella of “Godrej Interio” with unique offerings that didn’t exist in Indian furniture market before. Currently, more than 1000 product combinations are being offered in six varied platform designs totalling about 96 unique product offerings. Cigniti’s employee portal is an enterprise application for its internal employees to manage calendar, make meetings and schedules, request and manage leaves etc.,. Think Design’s interventions included User Interface design for the application where the current IA and navigation structure were revamped to present intuitive interface for its users. Colorbar’s shop in shop was unveiled in at Hyderabad Central. It was strategically planned and centrally placed around an existing pillar to create maximum impact. The challenge was to maximize the planogram in the limited space available and work knock down structure around the pillar. Think Design helped Whirlpool in arriving at the season’s CMF strategy for its line of Twin tub semi automatic washing machines. Out of three CMF variants introduced, Sports blue and Champagne won immediate reception. Competition followed suit after this! Visiontek’s 93 POS terminal finds application in mobile ticketing, spot billing, logistics and many more evolving businesses in India. The product was designed, considering tough environmental conditions and has innovative features that make it compelling to use! Colorbar’s compact dispensing unit features flexible and modular planogram that can be adapted to various requirements. This is extremely critical in small format retail outlets and bangle stores, where this unit is meant to be deployed. When Think Design was asked to design Whirlpool’s line of Home UPS/ Invertors, we had one thing in mind: “Totalization”. Whirlpool badly needed to get out of presenting a different face for each of its products. This proposition immediately struck chord with stakeholders in the company. Think Design designed and developed range of luxury bath accessories in Stainless Steel for Transel Impex. The range features thirty products intended for use in luxury bathrooms. Think Design is proud to present its design solution for first Colorbar Flagship store… Through this, we have set a new benchmark in Display and Dispensing design of Cosmetics. Think Design’s services involved Conceptualization, Engineering, Planogramming, Prototyping and Implementation. Hari Nallan presented tendencies of Indian middle class at Tokyo Design hub. The seminar witnessed participation from various Japanese multinationals interested in the Indian market. Hari presented case studies of designs that worked and that didn’t, with Indian middle class. Wrought Iron wall decor was designed and developed for Ferro Linkers, a premium export house in India, for consumption in European markets. Products were made by hand using indigenous techniques and tools. Further, optimization of material usage was intended without being obvious.